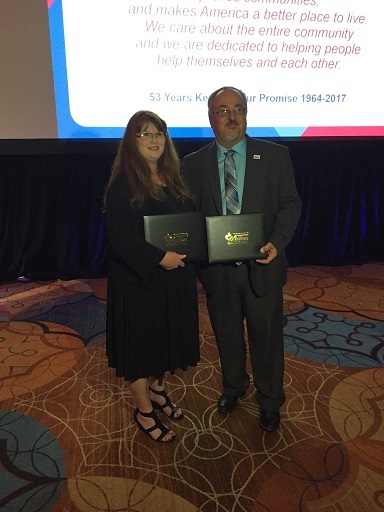 Bobby Deike, CCSCT Executive Director and Carol Delgado, CCSCT Community Services Program Director received their designations as Certified Community Action Professionals (CCAP) in Philadelphia, PA on Thursday, August 31, 2017. The ceremony was held during the Community Action Partnership National Convention Awards Gala. To accomplish the CCAP designation, individuals working in leadership positions in the field of Community Action must demonstrate mastery of Community Action Vision and Values, the History of Community Action, Management Skills, 21st Century Leadership and Addressing the Causes of Poverty. Both Bobby and Carol accomplished this by successfully demonstrating education, experience and training; developing and writing an Executive Skills Portfolio and passing the CCAP written examination. Bobby has served as Executive Director of CCSCT since August of 2013 and has worked in Community Action for 25 years. Carol has worked in Community Action with CCSCT since 2001.